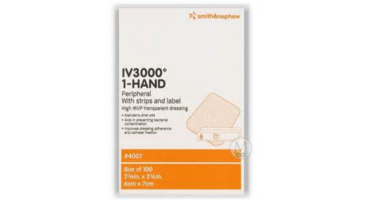 Smith & Nephew IV3000 1-Hand catheter dressings is a moisture responsive transparent dressing specifically designed to meet the needs of catheter fixation and IV Site protection. IV 3000 dressings are made from a unique REACTIC film, which is breathable and significantly more permeable to water vapor than ordinary film. This film dressing is waterproof and impermeable to liquids, bacteria and viruses when intact. IV3000 can be applied easily and aseptically and, due to the adhesive's pattern spread, pain on removal is reduced. IV 3000 1-Hand dressings have medical grade sterile securing strips and a documentation label.